I have owned pet mice for many years now and decided to compile some interesting facts about these adorable pets. Within the facts you will be able to gain a better understanding of how these rodents live, what they like to eat, behaviors that they display and reasons why I think they make good pets. Whether you have owned pet mice yourself before, are thinking about owning some pet mice or are just interested to read this article, thanks and I hope you gain something from it. Please leave a comment below if you have any questions or feedback. Mice are clean animals - This is sometimes a surprise to people who have never owned pet mice. You will need to clean out their cage once a week, replacing all the bedding and adding new cardboard or paper shredding to chews and nest in. Mice eat little and often - Mice are very easy pets to care for when it comes to feeding. They will eat anywhere between 10-15 small meals in a 24 hour period. They are nocturnal animals to ideally you need to put some food in their cage in the evening, then they will eat throughout the night and sleep most of the day. Mice are social animals - If you have ever tried to catch a wild mouse you will know how difficult it can be, especially if you are trying to rid your house of them. But pet mice kept in captivity and interacted with from a young age can be very social. Once they are familiar with you they will usually approach you to take food from your hand. You can handle them and they will happily run up and down your arms. Mice can breed quickly - It is very important when buying mice that you take time to make sure you only have either males, or females. Never have a mix of both or you will end up with a litter in no time, followed by another litter, and maybe another! Female mice can give birth to a litter of a dozen or so mice every 3 weeks, so you can appreciate how quickly your mice numbers can increase. Mice have poor eyesight - They have very bad eyesight and can barley see past the end of their noses. Therefore they rely on their other senses and tools to know what is around them. Their sense of smell is used to help find food, be aware of danger and recognize familiar things. Their whiskers help them to judge the size of gaps and distances, along with what type of surface they are standing on and the terrain. Mice like repetition - In the wild it has been proven that mice will use almost the exact same path from day to day to gather food and return to their home. This information can prove particularly useful if you are trying to catch wild mice coming into your home. Mice use both their tails and claws to climb - Not only do they have good claws for climbing but their tails have ridges on adding extra grip. Mice can grip well enough with their tails to hang off a ledge if needed. If you are thinking about owning some mice there are plenty of helpful articles online to guide you through the care, feeding and maintenance, I personally would recommend mice as a beginner pet for children, or a fun project for adults with an interest in rodents. In brief, you need to clean out their cage once a week, top up food and water once a day and play with them whenever you have time. They are really mow maintenance pets that offer a lot of fun and interest in return. You should never mix different kinds of rodents. Rats get along with other rats, but putting a rat and a mouse together will end in death for the mouse. Female mice do well living in threes or more. Male mice must live alone. 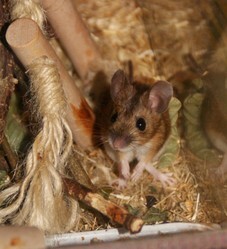 Even if you have male mice from the same litter, once they reach a certain age, they will fight, normally to the death. Having a male mouse, you just need to give them attention and lots of fun and enriching toys to play with and things to climb on.